Our son Milo was born on April 28, 2012! Both of us are healthy and happy, and everything’s been going very well. Brian and I are having so much fun with him, and my family, our doula Jessie, our doctor and all of our friends have been supportive and loving. (If you’re in the Tacoma, Olympia or Seattle area and looking for a doula, I highly recommend Jessie Keating, who was absolutely wonderful. She greatly reduced my anxiety about childbirth, was supportive of me and my husband in every possible way and was invaluable while I was in labor.) Thanks to everyone who’s asked about how things have been going… and of course, thanks to everyone who’s still reading, considering I haven’t posted since December! There’s your update on the flesh and blood humans behind this website, but what about the paper ones you come here for? Obviously I have my hands a little full right now, but I’ve had paperdoll plans on my mind lately. (I have rather a lot of downtime in which I can think about such things while this little guy is feeding, although what with all the sleep deprivation my thoughts aren’t quite as coherent as usual.) I’d like to start drawing again, and put some of my earlier plans and ideas into action, particularly the customizable doll. I expect there won’t be any action on that front for a number of months, but it is on my mind. I always return to paperdolls in the end, it seems! If there’s any paper doll related news, it will be here, though I can’t tell you exactly when that might be. To keep tabs on me in general, you can always see what I’m up to on Twitter! Congratulations! He is beautiful and I love his name. Congratulations! I was just thinking about you and your baby and lo and behold there’s an update. He’s beautiful and a blessing, which you know already. Don’t feel any pressure, there’s always time for paper dolls later and we’ll be here waiting. He’s only this little today, so snuggle him as much as you can. My baby will be six in August and you can never get enough of them to be satisfied. I was also thinking of you recently. I’m so happy for you! Enjoy your precious boy! Congratulations! I was missing your paper dolls, but now I see that you have a super excellent reason to be away from the blog! Being a mommy is absolutely wonderful. Congratulations! He looks adorable–I love his hat! Milo makes a great viking! I hope everything keeps going smoothly. I’m so happy for you! I diligently checked back weekly on your site, Liana, and I did keep up with your Twitter as well. It’s so good to hear that you’re pretty much back. Also, your son? Adorable! I’m glad you’re doing well! I am so pleased to hear you and your son are doing well. Congratulations on this new phase of your life. Also, that is an excellent hat. He’s so cute!!!!!!!! 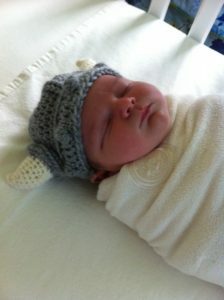 And I love love LOVE his little viking helmet-hat!!!!! Milo makes him sound even cutier!!!!! Awww! Congrats! He is soooo adorable! I am so glad your back though, I have been checking this site regularly since December and am so glad you are posting again. I can totally understand how busy you must be, what with the baby and all. Anyways, best of luck in the future! Milo and I are birthday buddies!!! What a unique name for such a unique little one! Congratulations on your handsome little son. God bless this new life! Congrats!! My mom just had a little boy too on the 31st! Liana, he’s adorable (and, yes, I’m loving’ the hat). But now it’s got me wishing for a baby Milo paper doll! He is so cute. Love the hat. Glad everything turned out well. Normally baby pictures bore the heck out of me. But this one was cute as can be AND gets bonus points for the baby viking hat. VIKING BAYBEE. How handsome! Congratulations, maybe there will be a paper doll of Milo soon, although I love your ladies. All the best to you and yours. Congratulations to both of you! Enjoy your son to the fullest! What a darling! God bless your little family. Congrats again, Liana! I just have to ask–would you ever consider doing hair and a dress for a doll? Because Rapunzel would be pretty incredible…*hint hint* ;) But take your time, no rush! Liana, my 3 1/2 year old daughter has just discovered your paper dolls and is so enthralled with them that she has had me printing, cutting, and coloring all day and it is now after 9pm and she is still coloring them in her bed. She does a pretty good job for being 3, too! I just wanted to thank you for running this blog and for the joy you are bringing to so many, children and adults (because I’m pretty enthralled myself). I hope you are enjoying your darling boy. I’m so happy for you! I cnat wait till you start updating again! I love him!!!! soooo cute! Congratulations, again and I’m glad you’re both well!